Methadone is widely used for the treatment of opioid dependence. Although in most countries the drug is administered as a racemic mixture of (R)- and (S)-methadone, (R)-methadone accounts for most, if not all, of the opioid effects. Methadone can be detected in the blood 15–45 minutes after oral administration, with peak plasma concentration at 2.5–4 hours. Methadone has a mean bioavailability of around 75% (range 36–100%). Methadone is highly bound to plasma proteins, in particular to α1-acid glycoprotein. Its mean free fraction is around 13%, with a 4-fold interindividual variation. Its volume of distribution is about 4 L/kg (range 2–13 L/kg). The elimination of methadone is mediated by biotransformation, followed by renal and faecal excretion. Total body clearance is about 0.095 L/min, with wide interindividual variation (range 0.02–2 L/min). Plasma concentrations of methadone decrease in a biexponential manner, with a mean value of around 22 hours (range 5–130 hours) for elimination half-life. For the active (R)-enantiomer, mean values of around 40 hours have been determined. Cytochrome P450 (CYP) 3A4 and to a lesser extent 2D6 are probably the main isoforms involved in methadone metabolism. Rifampicin (rifampin), phenobarbital, phenytoin, carbamazepine, nevirapine, and efavirenz decrease methadone blood concentrations, probably by induction of CYP3A4 activity, which can result in severe withdrawal symptoms. Inhibitors of CYP3A4, such as fluconazole, and of CYP2D6, such as paroxetine, increase methadone blood concentrations. There is an up to 17-fold interindividual variation of methadone blood concentration for a given dosage, and interindividual variability of CYP enzymes accounts for a large part of this variation. 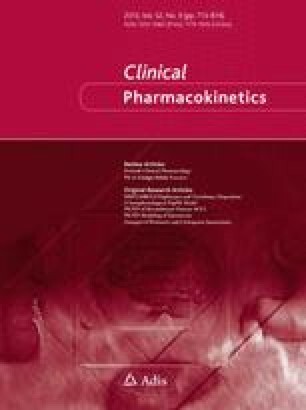 Since methadone probably also displays large interindividual variability in its pharmacodynamics, methadone treatment must be individually adapted to each patient. Because of the high morbidity and mortality associated with opioid dependence, it is of major importance that methadone is used at an effective dosage in maintenance treatment: at least 60 mg/day, but typically 80–100 mg/day. Recent studies also show that a subset of patients might benefit from methadone dosages larger than 100 mg/day, many of them because of high clearance. In clinical management, medical evaluation of objective signs and subjective symptoms is sufficient for dosage titration in most patients. However, therapeutic drug monitoring can be useful in particular situations. In the case of non-response trough plasma concentrations of 400 μg/L for (R, S)-methadone or 250 μg/L for (R)-methadone might be used as target values. Studies from our group (Prilly-Lausanne) mentioned in the present paper were supported in part by the Swiss Federal Office of Public Health, grant numbers 8045 and 316.97.0629, and by a grant from the Sandoz Foundation. We gratefully acknowledge the editorial assistance of Mrs C. Bertschi, and the bibliographic help of Mrs M. Gobin, Mrs E. Ponce and Mrs J. Rosselet. We greatly thank Stewart B. Leavitt, PhD, Glenview, IL, USA, Marc Shinderman, MD, Chicago, IL, USA, Jason M. White, PhD, Adelaide, Australia, Fernand Mathot, PhD, Liège, Belgium, and Andrew Byrne, MD, Redfern, NSW, Australia for their review and their helpful comments during the preparation of this paper.